Heart disease is the No. 1 cause of death, and there are some risk factors that are just a fact of life. For example, we can’t change our age or ethnicity. But that doesn’t mean we’re helpless in our personal battle against heart disease. There are risk factors that are under our control. Here’s a look at six risk factors you can change. People who smoke are at a much higher risk for heart disease than are nonsmokers. 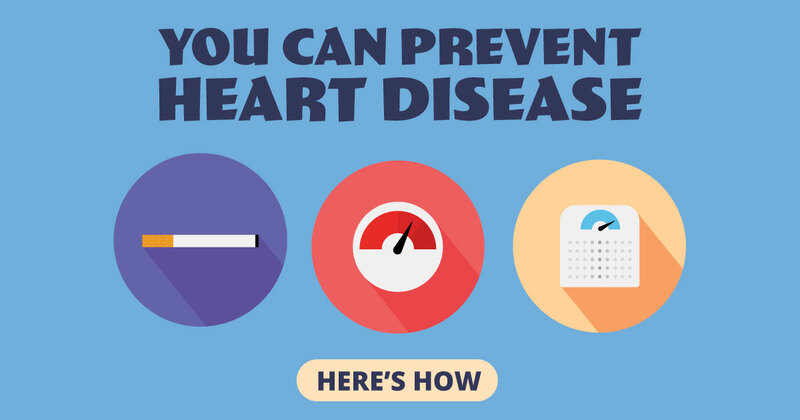 One of every three deaths from cardiovascular disease (CVD) is caused by smoking. What you can do. Ask your doctor about smoking-cessation aids that help people quit, such as nicotine replacement therapies, medicines and support groups. Don’t smoke? Remember—even breathing in someone else’s smoke is hazardous to health and heart, so stay away from secondhand smoke. Number to know. Your risk for a heart attack drops sharply just one year after you quit smoking. Being a couch potato is a major risk factor for heart disease. Getting regular physical activity can reduce your chances of having a heart attack or stroke. It also can lower your blood pressure, help improve your cholesterol numbers and help you keep a healthy weight. What you can do. Slowly begin building activity into your day. Walking is a good place to start. Just make sure to get at least 10 minutes of exercise at a time. Numbers to know. Shoot for at least 30 minutes of moderate physical activity on five or more days of the week. Also, work in two days each week of exercise that builds muscle and strength, such as weightlifting. High blood pressure can cause serious damage by forcing your heart to work harder. Uncontrolled high blood pressure can be fatal. It greatly increases your risk of heart attack, heart failure and stroke. What you can do. Exercising regularly, not smoking, maintaining a healthy weight and following a healthy diet are all important in helping control blood pressure. Number to know. You should aim to eat less than 1,500 milligrams of sodium a day. That’s just a little more than half a teaspoon of table salt. Over time, cholesterol and fat can collect in the inner walls of the arteries, including the ones that supply blood to the heart. This can lead to atherosclerosis, where arteries the start to narrow, which increases your risk for blockages. What you can do. A healthy lifestyle can go a long way toward helping you keep your cholesterol in a healthy range. Avoiding tobacco smoke, maintaining a healthy weight, getting regular exercise and eating a heart-healthy diet are all important. Number to know. You should have your cholesterol checked at least once every four to six years, starting at age 20. You may need more frequent screening if you already have heart disease or have other risk factors. Being overweight or obese can increase your risk for many health problems, including heart disease. And having too much fat around your waist may increase health risks even more than having fat in other parts of your body. What you can do. If you’re overweight, losing just 5 to 10 percent of your current weight may lower your chance of developing heart disease. Numbers to know. Body mass index (BMI) is one way to tell whether you’re at a healthy weight or not. It measures your weight in relation to your height. Check your BMI using this calculator. Waist measurement. Your health risks are higher if your waist measures more than 35 inches for women and 40 inches for men. What you can do. Modest changes in diet and activity can make a difference. If you have diabetes, work closely with your doctor to manage the disease. Number to know. Fasting blood glucose—taken from a blood test after fasting—should be less than 100 mg/dL. Find out if you’re at risk for a heart attack by taking our assessment.